The [Executive Immersion] conversations were rich, the dialogues were high-level and the course was relevant, well-articulated and robust. SIG, the premier membership organization for sourcing, procurement and outsourcing executives, today announced the return of the Executive Immersion Program (EIP). SIG is thrilled to launch this innovative program in the city of Chicago, Illinois. 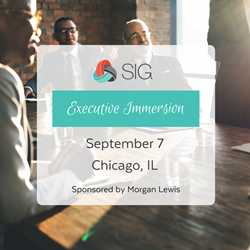 The SIG Executive Immersion Program will take place on Thursday, September 7th from 8:30 am – 4:00 pm and will offer intensive workshops in contract negotiation and contract construction in today’s world of RPA and AI. Hosted and facilitated by Morgan Lewis, this event will allow attendees to gather expertise from thought leader providers Ed Hansen and Peter M. Watt-Morse, while simultaneously networking with other local colleagues. These innovative industry leaders will focus on information technology–enabled transformation as well as customer and vendor outsourcing deal management and outline best practices to maximize business value across hardware, software, cloud, network, outsourcing and integrated solutions sourcing. The day will also include a look at a case study: Is your BPO Robo Ready? Putting it all Together. This afternoon session is designed to apply concepts learned in the morning workshop by examining RPA as part of a BPO solution. We will explore how shifting technology paradigms affect the BPO value proposition. The SIG Executive Immersion Program is designed for real-world situations at executive decision-making levels. Future workshops include topics on risk management, talent management, vendor management or other top-of-mind issues facing sourcing, outsourcing and procurement executives today. For more information on this program, visit https://sig.org/executive-immersion-program. SIG, is a membership organization that provides thought leadership and networking opportunities to executives in sourcing, procurement and outsourcing from Fortune 500 and Global 1000 companies and the advisors who serve them. SIG is widely known as a forum for sharing “next” practices and thought leadership through live networking events, virtual forums and a comprehensive online SIG resource center (SRC), which was developed by and for professionals in sourcing and outsourcing. The organization is unique in that it blends practitioners, service providers and advisory firms in a non-commercial environment. SIG is also the parent organization for SIG University, a one-of-a-kind certification and training program for professionals and executives seeking deep expertise in sourcing and governance for themselves or their teams, as well as Outsource, which provides unrivaled digital content for the opinion-formers and decision-makers at the heart of the outsourcing space.